Here's a quesadilla recipe that will please both taco fans and cheeseburger lovers alike—all for just 20 minutes of your time. Preheat oven to 425°F. Cook meat with Taco Seasoning Mix as directed on package. Heat Tortillas as directed on package. Spoon meat mixture onto bottom halves of tortillas; top with cheese and Salsa. Fold tortillas in half; place on baking sheet sprayed with cooking spray. Bake 8 to 10 min. or until heated through. Prepare as directed, substituting ground turkey for the ground beef and using KRAFT 2% Milk Shredded Reduced Fat Cheddar Cheese. 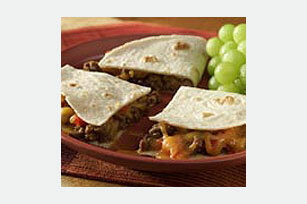 Assemble quesadillas as directed. (Do not bake.) Cover and refrigerate up to 12 hours. When ready to serve, bake, uncovered, at 425°F for 15 to 20 min. or until heated through.